1. The market is too small for your book. You could write the best book in the world. But, if it appeals to only 1,000 people, then your sales will struggle. Agents and publishers use market size as a primary filter to decide which book projects they accept. They can’t afford to invest in a manuscript with limited potential. If they don’t think a book can sell at least 10,000 – 20,000 copies quickly, they’ll usually pass. The problem of underestimating a market’s size tends to happen to first-time and self-published authors who overestimate their potential. They become blinded by passion for their message, which prevents them from developing a pragmatic point of view. A great way to avoid overestimating your audience is to check the sales history for other books that are similar to your content. For instance, you could look at various bestseller lists, talk to local bookstore managers, or track the Amazon rankings over time of comparable books. The actual audience is usually smaller than most authors think. 2. The market isn’t responding to your material. On the other hand, the audience for your book may be huge. There could be thousands of people who would love to get a copy. Yet, you find that the masses aren’t purchasing. You scratch your head wondering why you’re getting ignored in the marketplace. This problem can stem from numerous factors, such as a saturated genre, weak economy, boring title, poorly-timed release date, pricing is too high, inappropriate page count, inadequate marketing, lack of word-of-mouth tools, seasonal subject matter, etc. If your audience is big but your sales are small, then you have to be willing to honestly assess the above factors and make significant changes. You may need to invest more time and money into your marketing efforts. You may need to drop the price. You may need to re-release the book under a different title or at a different time of year. The market doesn’t lie. If people aren’t buying your book, it’s your problem – not theirs. Try talking with a knowledgeable person who can provide honest feedback based on experience, such as a literary agent, librarian, publicist, or bookstore manager. Check your ego, ask them for candid feedback, and be willing to make necessary adjustments. 3. The market doesn’t like your book. The biggest factor that hinders a book’s sales potential isn’t due to marketplace or industry factors. If a book isn’t selling well, the problem is usually the manuscript itself. To be frank, you didn’t write a very good book. I don’t mean to be critical…I say this to be helpful. You can’t see your way forward if you keep your eyes closed. Remember, the market doesn’t lie. Your audience has a limited amount of time and money. And, people make decisions for self-serving reasons…not to be conceited, but rather for self-protection. Nobody wants to waste their money and time on a bad book. As an author, you have to convince readers that your book provides tangible benefits, such as inspiration, entertainment, learning, or even being a part of the cool crowd. 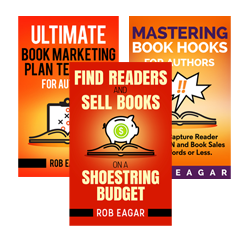 If your book doesn’t provide tangible benefits, then your audience won’t buy it. Don’t assume that your book is good. Create test groups of readers who fit your target audience, give them your manuscript, and ask for blatantly honest feedback. Many authors are scared to go down this road, because they fear the revisions and extra work that will be required. But, the feedback you receive could be the key that unlocks your book’s full sales potential. When I wrote my first book in 2001, I put together three different focus groups who represented different aspects of my target audience. Their feedback required me to rewrite every chapter three times – and my first chapter nine times! They were brutally direct, but they were right. Today, that book can still be found selling on the shelf of most Barnes & Nobles stores 10 years later. Regardless if you self-publish or go with a traditional house, work with a professional editor – even if it costs you extra. People hate reading poorly written books. If they browse your book and it’s low quality, then they won’t buy it. Plus, they’ll spread negative word-of-mouth. Editing is one of the few issues that is completely within your control. Don’t get cheap and settle for a bad manuscript..
I’m sure some authors would disagree with this point. But, I think authors kill a book’s sales potential when they write it too quickly, such as less than four months. Books need time to percolate in your mind, test on focus groups, and revise to a higher level. When you “crash” a book, you prevent the book from going to market with all of the necessary elements. A good book is like a fine wine. It’s needs time to develop complexity and a rich taste that will appeal to the masses. When a book doesn’t meet your sales expectations, be careful not to blame other people, such as your readers, your publisher, or even God (I’ve actually heard some authors hold the Almighty responsible). That’s like a parent blaming teachers, friends, and politicians as the reason why their kids didn’t turn out well. That kind of attitude simply keeps you stuck in your mistakes. In contrast, take full responsibility for the sales of your book. Use the three categories above to narrow down your problem to the core issue. Don’t beat yourself up. Rather, learn from your mistakes, and use that knowledge to improve your next book. The market doesn’t lie. If you write a great book for a large audience, they will surely buy.